Do you use a Mac every day? Learn these keyboard shortcuts to speed up your workflow. Do you use a Mac computer every day you come to work? Do you prefer to do things quickly instead of doing things slowly (on your computer)? Yes? Then I have the tip of a lifetime for you - stop using your mouse. Sometimes it's unavoidable, but committing a handful of keyboard shortcuts to memory can really speed things up, and also prevent Repetitive Strain Injury. Note: I'm going to use the letters cmd to represent the command key, the one with the ⌘ on it near your space bar. Activate the application switcher with cmd-tab, which has all of your open apps ready for quick switching. Use this always. Open applications with cmd-space, which opens the built-in Spotlight Search. Type in the name of what you want to open (or just the first couple letters) to find what you need. cmd-w will close whatever you are looking at, while cmd-q will quit the application entirely. Bonus: use Alfred for even more cmd-space shortcuts. Highly recommended if you use the internet. cmd-alt-left/right will switch to the previous or next tab in Chrome and Firefox (cmd-shift-[/] in Safari). Try it now and never need your mouse to switch tabs again! For all you sharpshooter tab navigators out there, you can hit cmd-1, cmd-2, cmd-... to navigate to the 1st, 2nd, 3rd... tab. Bonus: cmd-9 will often navigate to the right-most tab regardless of it's number. Also super useful for internet-ing: cmd-t will open a new tab, cmd-w will close the current tab, and cmd-shift-t will reopen the last closed tabs. Bonus: cmd-shift-w closes all tabs in the current window. You can click cmd-shift-t over and over to keep opening through your history of closed tabs. Total must haves for typing. Never type that really long sentence or URL again, instead copy selected text with cmd-c and paste with cmd-v. If you need to move a bit of text from one place to another, cut it (copy and delete simultaneously) with cmd-x and paste it where you need it. And if you just want to delete everything and start over, cmd-a will select all text in view, ripe for a swift delete. History Lesson: cmd-p has always been reserved for Print. Sorry Paste. Accidentally just deleted an entire email you've been working on all morning? cmd-z will undo your latest action. cmd-shift-z will undo your last undo! Also incredibly handy for typing. Typically, alt-left/right will jump your cursor around words, while cmd-left/right will fly all the way to the beginning or end of a line, and cmd-up/down all the way to the top or bottom of whatever you're typing in. Bonus: Combine any of these shortcuts with the shift key and you'll select the text that you're flying over. EXTRA Bonus: You can use alt and cmd with the delete key to delete entire words or entire lines with one keystroke. This one just missed the Must Haves list. If you're viewing a web page, you can click cmd-l to instantly focus on (and highlight the contents of) the URL bar. Very handy for quickly switching to Instagram when Facebook becomes boring, and other important work things. Tidbit: I literally remember the day my life was changed when I learned this. Thanks Pat. Don't bother aiming your mouse at the little roundy-arrow, cmd-r will trigger a page refresh. Capture your entire screen with cmd-shift-3, or use cmd-shift-4 to draw a box around just the things you want to screenshot. Bonus: After clicking cmd-shift-4, tap space to take a screenshot of a specific application window. And hold space after you've dragged out a box to move the box around to make it just right. If you're using the default (small) Mac keyboard, there's only one key for deleting text, and it goes backwards. Delete text in front of your cursor with fn-delete. Hide the app window you're looking at with cmd-h. Minimize it with cmd-m, and blow it up to full screen with cmd-ctrl-f. Bonus: Hide all other application windows with cmd-option-h. Handy to know at times. cmd-squiggly will switch between open windows of the same application. So if you have 3 Chrome windows open, you can quickly switch to the work email one when your boss walks by without fumbling for your mouse. After a long day of working hard, your email client occasionally decides to show you a beach ball indefinitely instead of your mail. Open up the Force Quit Menu with cmd-alt-esc to shut it down with some Force. Advice: Use your left thumb to hit both the cmd and alt keys so it's easy to reach the esc key. 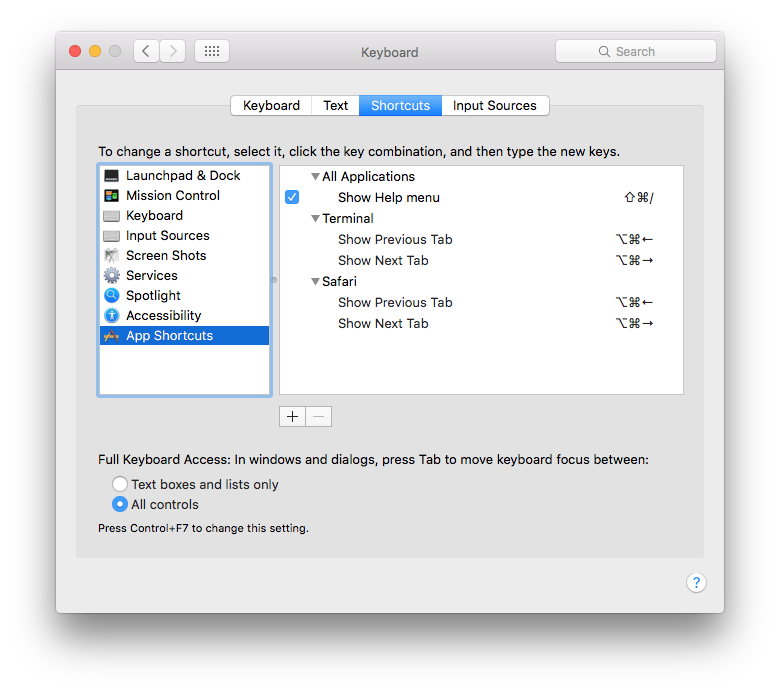 There is a Shortcuts Tab in the Keyboard section of System Preferences. If all of these shortcuts aren't enough for you, you can add App Shortcuts entries there to trigger any available option from an application's menu. Did I miss anything vital? Did I just improve your life dramatically? Let me know in the comments below.